Okay, this is one seriously stylish cover image. 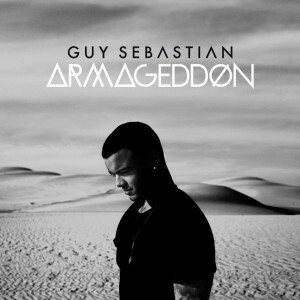 Guy Sebastian has late this morning broken cover on his brand new album ‘Armageddon’. The new album, the singer’s sixth, is rumoured to be released later this year. It’s set to feature Guy’s current No.1 smash ‘Battle Scars’, which this week spent a fifth consecutive week atop the ARIA singles chart. Presumably the album will also feature previous singles ‘Gold’ and ‘Don’t Worry Be Happy’, but that’s also yet to be confirmed. The album will be instores and online from Friday 12th, October, 2012. The new LP will be released on Standard and Deluxe Editions. The New CD will have 12 tracks and the Deluxe Edition comes with a bonus DVD will LIVE recordings of Guy’s Recent Tour 2012. Both Standard and Deluxe Editions are now available for pre-order from both Sanity and JB HI-FI. I CAN CONFIRM THAT MORE INFO INCLUDING RELEASE DATE, TRACK LIST ETC ETC WILL APPARENTLY BE ANNOUNCED TONIGHT/EARLY TOMORROW. STAY TUNED !!! LOVING THAT COVER ART!!! Simple yet stylish. Can’t wait for the album. The title track is the best Guy song I have ever heard!! Hope it becomes a single!